The well-known Newton-Rhapson algorithm is used as a starting point for findings till another method for inverting tri-diagonal matrices. It is shown that this method is closely related to 1-D MultiGrid algorithms. The notion of Persistent Properties is developed. 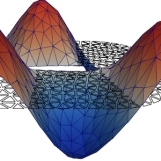 The behaviour of a product of the matrix coefficients can be understood in full detail, with help of a Connection to Goniometry in a dangerous domain and a Hyperbolic Connection in a safe domain. The safe domain is quite distinct from the dangerous one. The quotient of matrix coefficients proves to be an exponential function of the grid spacing. It is shown thatall safe solutions form a certain subset of the analytical solutions of the second order linear ODE (Ordinary Differential Equation). The matrix coefficients can be expressed in the coefficients of this ODE and the grid spacing. Furthermore,a link to the L.U. decomposition of matrices is established.